Sorry I’m getting to this only now. It’s a wonderful account, but then you sisters are wonderful too, and so is your mother. It was a great pleasure to spend a day with you. Thank you, Maureen! 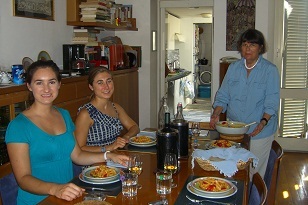 We loved our cooking day in Rome with you, too! It was a pleasure meeting you. Cheers to good eats.